With Woolworths losing their exclusivity on Google Play Gift Cards, and the cards now available in more stores, the sales can begin, and it’s the encumbent who is making the first move. Woolworths is advertising 10% off their range of Gift Cards, including Google Play Gift Cards from tomorrow, the 9th of April until Tuesday the 15th of April. 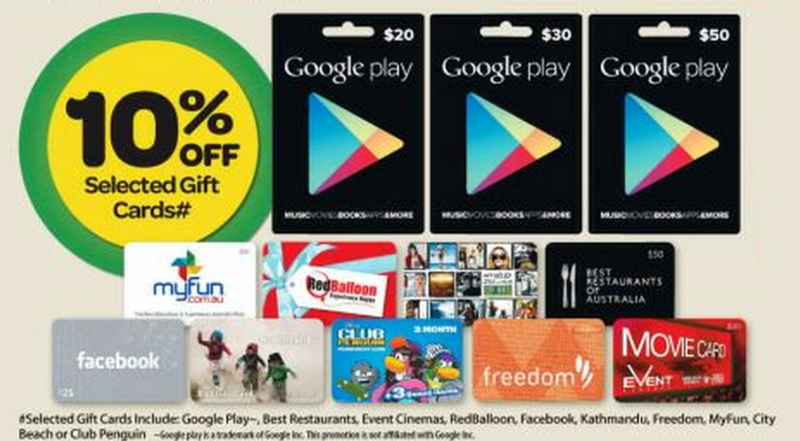 As well as Google Play Gift Cards, the 10% discount also applies to Best Restaurants, Event Cinemas, RedBalloon, Facebook, Kathmandu, Freedom, MyFun, City Beack and Club Penguin gift cards purchased from Woolworths during this period. While 10% is nice, with more retailers now in play, it’s certain we have yet to see the real sales as yet. Nevertheless, 10% off is nothing to sneeze at, if you’re after some Google Play credit at 10% off, head out to your local Woolworths and pick up a few from tomorrow. Previous PSA: Redeem your Google Play Credit from Nestlé Australia by May 31st or lose it. Went into local Woolworth’s, no sale dockets to make people aware of the sale, so asked at the service center, they told me I was wrong that there’s no sale. I pulled out my Nexus 5 went to http://www.ausdroid.com.au and BAM! Showed the staff members, they open their catalogs that are on their desk and there it was, 10% off PLAY STORE! THANKS AUSDROID. Been waiting for a sale. Combine this with the staff discount and it’s pretty decent. Time to top up! Time for us to make friends with these fine folks at Woolies! Be friends with someone (or their spouse) who works at Woolworths, Big W, BWS, Dan Murphy etc. Thanks, I’ll be buying one for a birthday gift. Google have some great discounts and I think a bit of a credit on hand at 10% dicount would be nice! Thanks for the warning! Stop the presses! Amazon Prime Video is coming to Chromecast and Android TV · 2 hours ago. Put Google Assistant in any Car with Anker Roav Bolt, we may even see it in Australia · 11 hours ago. Here are some official looking renders of Google Pixel 3a and Google Pixel 3a XL · 13 hours ago.